WICKER PARK — Some restaurant owners along Division Street will need to restore damaged tree pits and protective fences if they want to offer an outdoor sidewalk cafe this spring, a Wicker Park alderman said on Monday. "The proper thing is, if you have your dirt [over a tree] covered, remove it. 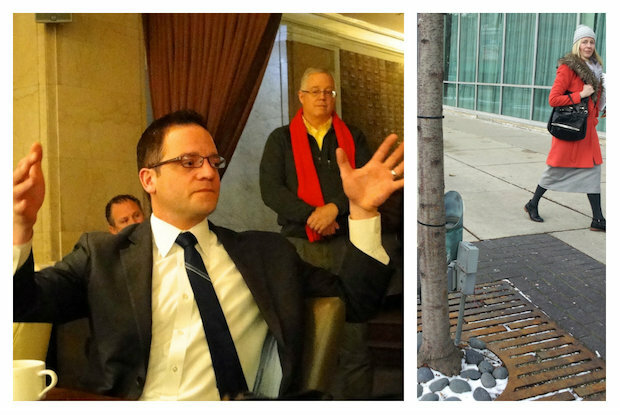 If fencing around the tree was removed, put it back in," Ald. Joe Moreno (1st) said to about 24 business owners at a Monday morning meeting at The Bedford, 1612 W. Division St.
"We want to restore the fencing — Red Square — that the taxpayers paid for," Moreno added, referring to Red Square, a spa at 1914 W. Division St. that removed fences installed by the city and "bricked in" soil around trees to make more space for a sidewalk patio over the summer. Earlier this month, Moreno issued a letter to business owners on Division Street announcing a hold on new sidewalk cafe permits until tree pits are restored, a bold effort to crack down on already altered parkway trees, some that have been cut down, have roots covered or fences removed. John Kirchner, director of the city's Department of Forestry, told the group that if there is proof that trees have been illegally modified without consent or without proper permits, the city will prosecute business owners. Kirchner said any new sidewalk cafe permit application would be considered a falsified document if the cafe does not look as it originally appeared. Janet Attarian, a Streets Director with the city Department of Transportation, said that a tree needs its soil to be exposed and not walked over or bricked in. "Walking over soil can compact soil to the same density as concrete," Attarian said. When asked how the city will go about restoring the damaged tree pits, Attarian said, "Tree pits will be restored on an individual basis." David Ginople, a volunteer commissioner with the taxpayer-funded Special Service Area No. 33, said the group and Chamber of Commerce could potentially help business owners with the expense of planting new trees, but replacing fences that the group had previously installed will not be possible due to budget cuts. After the meeting, Raymond Valadez, chief of staff for Moreno, said the 1st Ward office has a goal of restoring the trees and fences before sidewalk season begins March 1. Valadez said there are eight or 10 businesses along Division Street between Ashland Avenue and Wood Street that will need to restore tree pits, either by removing bricks that are covering the tree's soil or by re-installing fences that protect the trees. Michael Taus, owner of Taus Authentic, which plans to open in mid-February at 1846 W. Division St., said he decided to rent the former Prasino storefront because of its large existing patio. The former Prasino patio, which runs nearly a third of a block, has four parkway trees and a capacity for 90 people. "The trees are beautiful; I've been watering them," Taus said. Four years ago, the soil around the four trees was covered with a permeable brick so that Prasino could have more patio space. The four trees do not have any protective fencing around them. Taus said he will lose between 30 and 40 percent of his restaurant patio space if fences are installed around the four trees in his future sidewalk cafe. "I will work with the city to correct this. The alderman has been great and very supportive. But it is causing some stress," Taus said. Tom Tomek, a local Realtor who works on Division Street and has been somewhat of a whistle blower when he sees trees being damaged or altered, said he thought it was "a productive meeting." "It was good to hear that Division business owners need to restore the trees and fences. Moreno is putting pressure on these businesses. He knows it is a big issue in the community. Making it happen and follow-up will be key," Tomek said. Marija Milicevic, a general manager of Red Square Spa, was not available for comment after the meeting. Reached by phone, a spokeswoman for the spa said Red Square will be complying with the law and re-installing the fences before applying for a sidewalk cafe permit.